Lolo's Great Adventure (ロロの大冒険, , Lolo no Daibouken?) 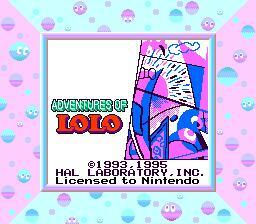 was originally developed and released in Japan for the Game Boy, and later localized in Europe as Adventures of Lolo for the Super Game Boy. 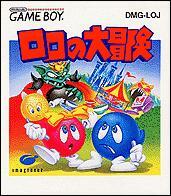 It is the 7th Japanese game in the Eggerland series, as well as the 6th and last to be released in Europe. It was never released in North America. The original Japanese version contains 50 puzzles: 10 Levels with 5 Rooms each. The European version contains 144 puzzles: a tutorial with 19 rooms, 5 "intermediate" levels with 14 rooms each, 10 "advanced" levels with 5 rooms each, and 5 "Pro" rooms. 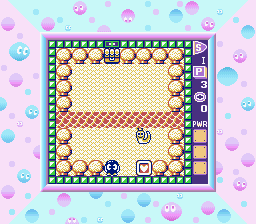 The European version also features Super Game Boy support, a puzzle-solving option (technically a secret), and the music changes slightly whenever Lolo faces a different direction or is standing on a certain surface. The opening story sequence also is different in each version. This game was not released in North America. This is Gentryland area. It is an amusement park that is fun for everyone. Today Lolo and Lala, accompanied by their child Lulu, have come to Gentryland. But none of the attractions are working. It seems that King Egger, an incarnation of evil, has occupied (captured) Gentryland. Under this situation, Gentry-Parade will not be played, which everyone want to see most. Can Lolo and Lala defeat hateful King Egger? Can Gentry-Parade be played? Entry Level: First Steps in Eden - This is an introductory level designed to help you learn your way around Edenland. Use this level to learn how each type of monster attacks, and to figure out how to counter-attack and trap them. Intermediate Level:- Dance and Music - Everyone in Edenland loves singing and dancing. King Lolo is a famous musician in Edenland, and his wife, Queen Lala, is a brilliant dancer. Everyone is entranced by the royal couple's music and dancing. Everyone in Edenland has been excited and busy for days, preparing for the next performance, which will include Rock 'n' Roll, Hula Dancing, exotic Oriental Dance, Flamenco, and Classical Ballet. But on the day before the performance, someone (or some group) has stolen the music score. The thief (thieves?) have hidden the pages of the score in Treasure Chests all over Edenland, and sealed the Treasure Chests shut. Advanced Level: Let's go to Gentryland - This is Edenland's Gentryland area. It is an amusement park that is fun for everyone, young and old. Today Lolo and Lala, accompanied by their son, Prince Lulu, have come to Gentryland. Unfortunately, none of the attractions are working. It seems that King Egger, a well-known trickster, has moved into Gentryland. What is more, he has locked all the attractions and put his monster henchmen on guard. If the keys are not found, no one will be able to see the famous Gentryland Parade. If you want to get your hands on those keys, you will have to solve all the riddles and puzzles that King Egger has left in the park. You are the only one who can get rid of King Egger and his henchmen and reopen Gentryland to the public. This page was last edited on 5 February 2018, at 02:33.